This month's efforts have been on building a clever company wide contact list. Initially to be able to associate an injury with an external company's employee but could also be used to store ALL your contacts in one tidy and secure place. This has lead us to include a thorough, searchable contact management system that will be used in future business modules as well. Often company addresses and contact details are stored in spreadsheets and personal email software which are hard to share and become out of date or versions become out of sync with each other. MyWebWorkplace's contact list allows your important contacts to be stored centrally. The contact list is fully searchable by any user ensuring a contact name or number is never hard to find. MyWebWorkplace holds all types of information to help your business to run more smoothly. Some of this information is mundane and some is shared within the company. Other information is, however, private or sensitive and because of this we have added an additional level of security to deter prying eyes on an unmanned, logged in PC. If you have permission and want to view a page that holds sensitive information you will have to unlock the extra security before viewing the page. You can remove the lock for a period of time and lock it again once you have finished so as not to interupt your legitimate browsing and leave MyWebWorkplace open in the knowledge that private information is perfectly safe. We host MyWebWorkplace on our own dedicated servers to ensure the fastest and most reliable service possible. Although this is obvious when you use MyWebWorkplace there is always a small delay when you click to see the next page/record as the request flys up to our servers and the data is returned. While this might be only a few seconds, it can add up and we felt it goes against MyWebWorkplace's afforts to help streamline and speed up your business. Now, when browsing pages that run into multiple pages it takes no time to flick through and find what you're looking for, no time at all. Each login creates a unique one time value for an encrypted cookie and expires after 24 hours which has a corresponding value in the DB (You can't fake the cookie). We also employ other security measures to prevent or trap would be hackers that shall remain undocumented. 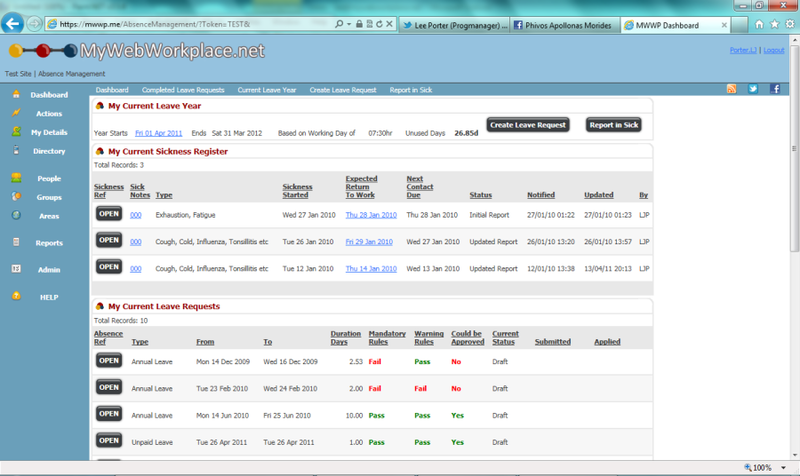 We are very please to announce the release of our most significant update to MyWebWorkplace yet. It is especially important as it represents the transition from a comprehensive business absence management system to a multi-modular business management system (sometimes known also as a business automation system). The priority in this release was to add the beginnings of an HR system but also to add more control and flexibility to our users access and permissions. This will become increasingly more important as we add more business modules. Here is a summary of our recent developments. New module: HR Lite - FREE WITH OUR EXISTING ABSENCE MANAGEMENT SOFTWARE - employee personal information collection such as home address & next of kin etc. As always, thank you to our valued clients for their welcome feedback and be assured of our continued focus on providing you with the best. We have chosen Zendesk to provide our Knowledge Base and ticketing system to help support MyWebWorkplace. With such a system in place, our support agents can provide the first class support that our clients have come to expect. How MWWP manages additional entitlement after a certain length of service?